Hello fellow Texas native plants enthusiasts! 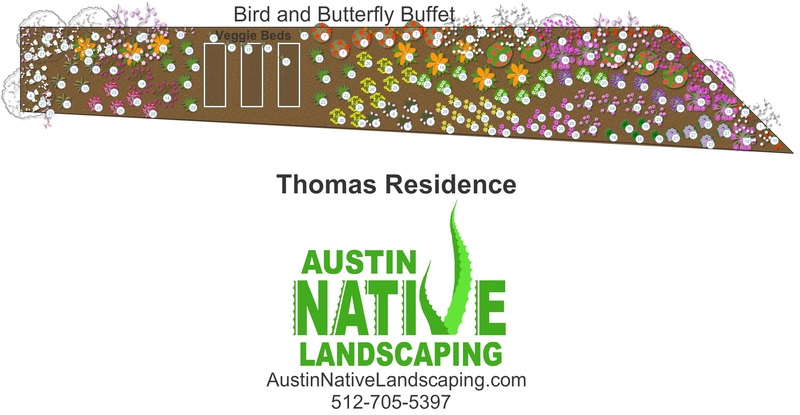 We are going to present two recent landscape designs we were commissioned and explain a little bit about them. 1. Food – Pollen, Foliage and Berries. It is important to remember that different plants provide those components during different times of the year. It will be much more beneficial to have a bunch of staggered blooming and fruiting to assure an almost around the year sustenance. 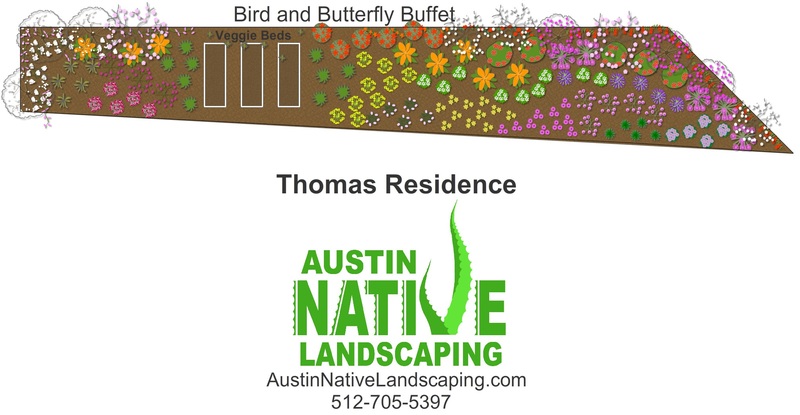 In all of our wildlife designs we try to mix a bunch of plant families together to brew a truly magnificent wildlife buffet landscape. 1. Anacacho Orchid Tree. An attractive and drought resistant tree. Completely covered with white blooms at spring. Anacacho Orchid Tree is also highly deer resistant. 2. Texas Redbud. No need introducing this classic and popular flowering small tree. Covered with unique looking pink blooms at early spring. Texas Redbud is a solid pick for any landscape regardless wildlife emphasis. 3. Texas Mountain Laurel. Another classic and a personal favorite of ours. Spring Purple flowering on a beautiful small statured evergreen tree makes Texas Mountain Laurel a wonderful choice. Highly deer resistance. Slow grower. poisonous seeds. 5. Texas Sage. Who haven’t seen this plant in Austin? It’s practically everywhere and for a good reason. 6. Gaura. Butterflies adore Gaura and its neat appearance makes you adore it as well in your own landscape. 7. Flame Acanthus. An outstanding shrub that provides food for butterflies and hummingbirds alike. Flame Acanthus has a very long blooming season. 8. Bamboo Muhly. One of our favorite grasses to use ever. Don’t be concerned; Bamboo Muhly is affiliated to bamboo by name only. 9. Big Muhly. An attractive substitute to Pampas Grass. Big Muhly is a very attractive tall ornamental grass that will show its handsome seed heads in fall. Very deer resistant. 10. Cross Vine. An outstanding and vine that is not only flowering but also is a vigorous evergreen. Cross Vine is one of our top vines to use in our design install practice. 11. Coral Honeysuckle. Blooms attract hummingbirds and berries bring in the birds. This semi evergreen is a good pick. 12. Trumpet Vine. Blow the trumpets for this vine as it is an extremely vigorous and aggressive spreader that nourishes hummingbirds. 13. Turk’s Cap. Extremely long flowering period means god little creatures can fatten themselves for a good while. Turk’s Cap thrives both in full sun and in heavy shade. 14. Perennial Winecup. This deciduous ground cover is a larval host plant for the Gray Hairstreak Butterfly. 15. Softleaf Yucca. This yucca, you guessed it, has soft leaves unlike most of the other yuccas. An attractive white bloom will appear in the summer. 16. Twistleaf Yucca. This smaller yucca is a larval host plant for the Yucca Giant Skipper. 17. Little Bluestem. Skipper Butterfly love it and will skipper town just to feast on it during the fall. 18. Butterfly Bush. Its in the name… This god sized shrub will attract a number of different butterflies. 19. Wooly Butterfly Bush. This shrub is like a more surly version of the Butterfly Bush above. Orange flowers. 20. White Mistflower. This great medium size shrub will explode with white blooms during the fall. White Mistflower attracts both butterflies and hummingbirds. 21. White Honeysuckle Bush. A deciduous good sized shrub that will have white blooms in the spring and red berries in the fall. Birds, bees and butterflies will feast on this water wise perennial. 22. Frog Fruit. An unusual groundcover that thrives both in full sun and full shade. Butterflies love its long blooming tiny white blooms. 23. Texas Wisteria. This extremely drought resistant vine will attract a multitude of insects and butterflies. 24. Texas Lantana. This indestructible tank of plant will provide a very long season of orange yellow flowers from Summer to Fall which butterflies will go crazy over. 25. Cherry Sage. One of our all time favorites. Evergreen, drought resistant and very long flowering. This plant is a must in most Texas native plants scenarios. Highly recommended. 26. Yarrow. This evergreen perennial will grow well in both full sun and heavy shade. Painted Lady Butterfly loves laying its future babies on it. 27. Fall Aster. Another highly reccomended plant and a personal favorite. Fall Aster’s amazing looking purple blooms that completely cover the plant in fall. 28. Purple Coneflower. A true classic in its appearance. 29. Blackeyed Susan. A compact perennial that graces the landscape with its bold yellow blooms in the summer. Butterflies love dat nectar. 30. Henry Duelberg Sage. Butterflies and Bees love its sweet nectar from its very attractive dark blue flowers. Enjoy your lawn 24 hours a day. Our lighting specialists can turn your lawn into a real head turner once the sun goes down. Keep your pathways well lit and your landscape beautiful and safe anytime of the day.